Get away of Siem Reap, take your 2 days trip to Battambang and get new experience. Siem Reap, Battambang tour is going to empress you with amazing sight and experience. Battambang has a unique charm among Cambodia’s larger urban centres. It seamlessly blends together the outlook of a modern city and small-town friendliness, set against the backdrop of some of Cambodia’s best-preserved colonial architecture. Timeless hilltop temples and bucolic villages can be seen on leisurely day trips by bicycle, Remork (Tuk Tuk) or car. The most scenic river trip in the country links Battambang with Siem Reap. Leaving Siem Reap at around 08:00am, the trip will take you roughly 3.5 hours drive by overland with a stop at Preah Net Preah, a local stone carving village. Arrive in Battambang, check in at your hotel. Conduct your afternoon tour after a swift lunch at a local restaurant. For small family or couple, your tour will conduct by Remork (often called Tuk Tuk), with a local host guide who will bring you to explore and experience through the lush country side. Firstly, you will visit Wat Ta Mem and learn more about Pagoda Life in Cambodia. 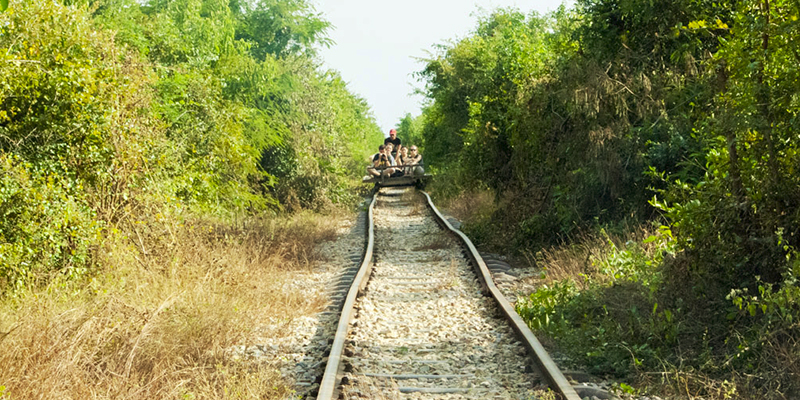 Continue to the Bamboo Train Station located a short distance away and board the tiny train. This small engine powered train has a bamboo platform of 3 by 3 meters and can be considered the smallest passenger train in the world. The train can be completely dissembled to allow other transportation to pass on the single railway. 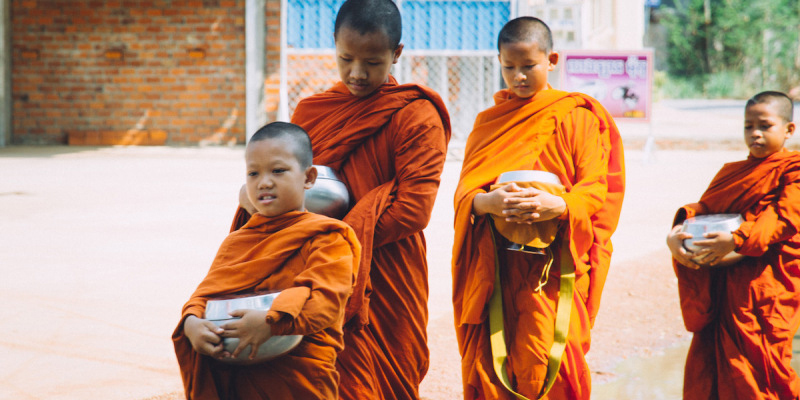 Continue through Cambodia’s countryside and meet the friendly local people transporting anything from fresh market produce to motorbikes and construction materials on the way. Next visit is the brick factory, located at the end of the rail track and before continuing to Wat Balatt. Here the you can enjoy a local snack and travel through small villages to the Killing fields of Battambang. 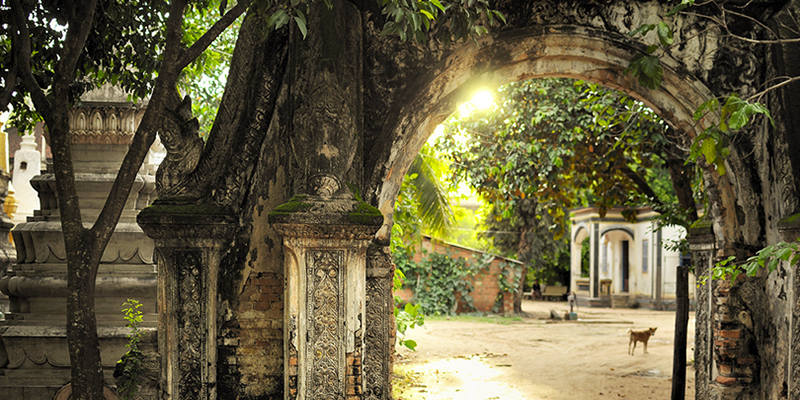 Learn more about the history of Battambang during the Khmer Rouge years. Next village visit of Somrong Khnong and Doun Tiel, visit the local people who produce sticky rice, rice paper, knives and a fish farm. Visit people at their beautiful Khmer home. We back to Battambang town for lunch break and then continue to see some old bridges which built during the French colony time on the way up to Phnom Banan. The hillside temple is located 25km south of Battambang and is like a smaller version of Angkor Wat. Built in the 10th century, its location is stunning. Enjoy the ride on the way and climb the stairs to the top for a beautiful view over the plains below. Return to town making a stop at the Battambang Winery. Unknown to the world, Cambodia also grows grapes and produces its own wine. With the help of foreign experts, medium sized wineries can be found around Battambang. Stop at one of the wineries and taste the Cambodian wine. Opt to walk around the property to learn more about the process before returning to the hotel for an evening at leisure. Overnight in Battambang. Today, you will travel to Banteay Chhmar. Meet the local people at the community and you will be introduced and explained about their jobs, involvement and activities they are doing to support the local people. Before touring to the temple, you are invited to join some amazing experience, get a ride on the Ox cart around the area escorted by a local professional guide from the community. Visit the temple and lunch at the local house within the community. Extension for overnight trip is available. The overnight stay at the local house is book-able on request, organize by the local community “CBT” Community-Base Tourism in Banteay Chhmar. Community-Base Tourism is a group of local villagers dedicated to preserving and protecting the cultural heritage of the area as well as creating a sustainable tourism industry in Banteay Chhmar. The CBT was originally started in 2007 with the aid of a French organization Agir Pour le Cambodge. 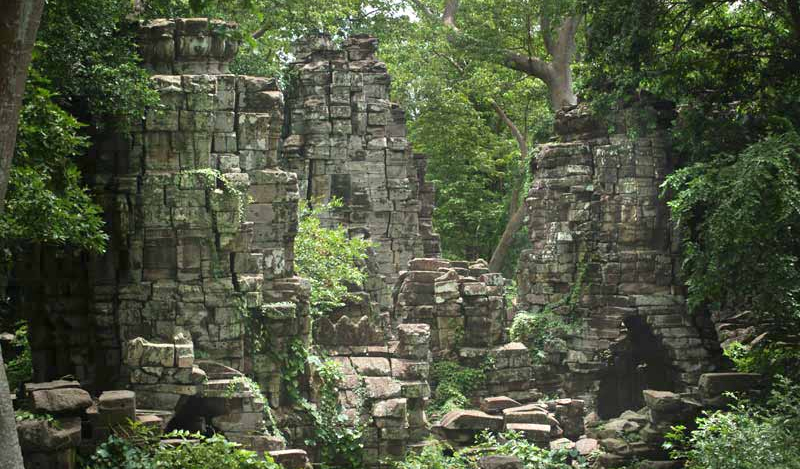 In 2009, Global Heritage Fund (GHF) began work on documenting and conserving Banteay Chhmar Temple. They formed a partnership with the CBT. In addition to GHF, Heritage Watch is also working in cooperation with the CBT. Heritage Watch is helping in areas of educating the local population about the importance of protecting Khmer cultural heritage and the benefits to their livelihoods from tourism activities. They are also involved in an English-language and tour guide training program for the Banteay Chhmar tour guides. Lunch and dinner will serve at the local house within the community. Overnight. 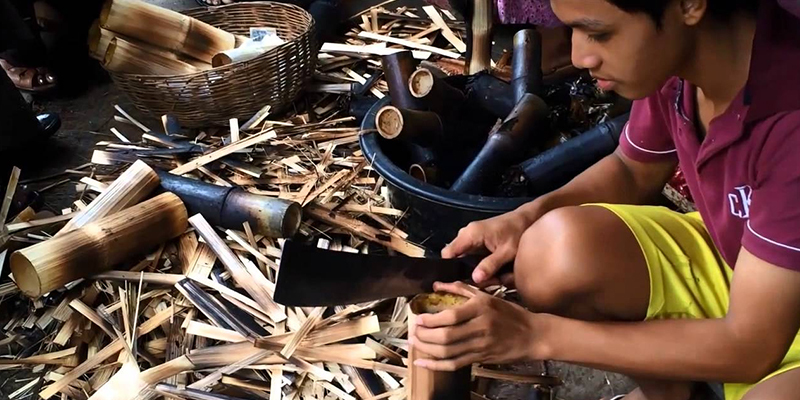 After breakfast – drive by overland to Siem Reap with a stop at Angkor Silk Farm in Puok, to see and learn about the process from the mulberry bushes cultivation to the production of silk fabrics and accessories. As the Silk Farm covers an area of 8 hectares, of which 5 are used for the mulberry trees plantation, you will enjoy the beautiful setting while learning about the fascinating process of silk-making. 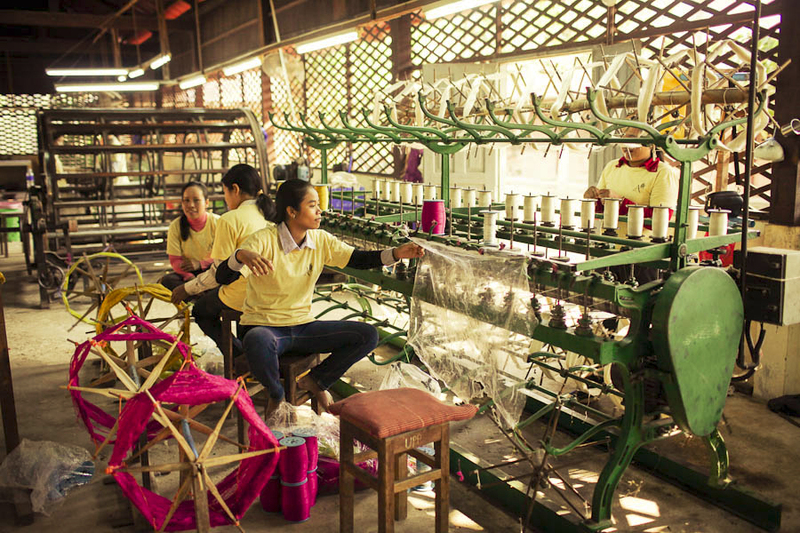 During your visit, professional guide who works on site will give you more details on the mulberry trees, silkworm farming, cocoon unwinding, preparation of the silk threads, ikat technique (tie-dyeing of the threads) and silk weaving. We are sure that you will be impressed by the dexterity of the artisans with silk threads. At the end of the visit, enjoy a large showroom where you can buy high-quality silk products that were made in the workshops you just visited. Drive straight to Siem Reap and Overnight at your hotel. End of services! – Pure drinking water and refreshing towels during the sight-seeing.